This time last year, we put a stake in the ground by announcing that HubSpot was building a centralized platform. We believe the world has changed. We see businesses using more kinds of software, not less, that all needs to work together. To help our customers grow better in this environment, HubSpot is evolving from an “all-in-one” suite into an “all-on-one” platform. Delivering remarkable end-to-end customer experiences is a team sport. Our goal in becoming a lovable platform is to make it easy to complement HubSpot with a rich landscape of apps built by other companies, or custom apps built uniquely for your business by an agency or your own developers. We want to make it easy for our customers to orchestrate all of this. 1. We listed 94 new apps in our directory, growing our platform partner ecosystem by 70%. Good platforms are flywheels: More customers attract more developers, who build more apps, which attract more customers, and so on. Customers get an ever wider set of capabilities, while developers get an ever wider audience they can distribute their apps to. That flywheel is starting to accelerate on our platform, and it’s inspiring to see the wide variety of innovative companies who are bringing new integrated apps to our customers. We welcomed 94 new official apps into our ecosystem in 2018, bringing our integrations count to over 200 across 17 categories, that help grow our customers’ businesses. One of the categories that grew the most in 2018 was Calling. Just within that category, you can find 21 different apps for video conferencing, integrating with cloud-based phone systems and call centers, inbound and outbound SMS, voice-powered chatbots, AI-driven analysis of phone calls, and more. Many more exciting apps are in the pipeline now and will be launching over the course of 2019. We also built a number of native integrations last year, including Zoom, Slack, Shopify, Stripe, Youtube, and Workplace by Facebook. We deliberately invest in a small number of native integrations relative to our ecosystem’s size. This allows us to focus our developers’ time on the handful of companies that we know will be the most valuable for our customers. For instance, we were launch partners for some of Slack’s new APIs, enabling a deep integration between our two products. We were a launch partner for Workplace by Facebook. And we built a groovy new YouTube integration for actionable video metrics. Whenever we build an integration ourselves, we look for ways to enable other partners in our ecosystem to build off those same extension points. For instance, when we built our Shopify integration, we also created the Ecommerce Bridge API, which enables companies to sync and manipulate ecommerce data using HubSpot functionality. One of our integration partners, Unific, enables customers to connect their Magento, Shopify, Bigcommerce, or WooCommerce store to HubSpot using this API. We also recently added a tight integration with Zoom and are working to make it possible for other video conferencing providers to plug into HubSpot in the same way. 2. We added 95 new API endpoints and hosted our first annual platform partner day. Our product teams have been enthusiastically opening more APIs and UI extension points to enable developers to build and integrate more kinds of apps on our platform. Last year, we added 95 new API endpoints (for a total of 355), creating programmatic access to tickets, products, line items, CRM pipelines, GDPR compliance features, and more. We launched an Ecommerce Bridge API and Analytics API to facilitate deeper integrations with a wide range of partners in ecommerce and analytics categories. And we unveiled a new Workflow Extensions model that lets partners create branded, native-like actions for customers within workflows across our Marketing Hub, Sales Hub, and Service Hub products. Last spring, we also hosted our first annual Platform Partner Day at our headquarters in Cambridge. Over 60 of our top integration partners joined us to meet with our engineering and marketing teams, learn about upcoming product releases, and discuss how we can jointly create better apps and integrations for our shared customers. We’re now gearing up for our second annual Platform Partner Day this spring with exciting new developments to share and even greater opportunities to collaborate. 3. Customers adopted integrations at a record pace. There’s a positive correlation between the number of apps a customer connects to HubSpot and their growth on our platform. It makes sense: The more our customers invest in a unified experience for their customers, the more they can accomplish. App adoption across our customer base in 2018 was record-breaking. The vast majority of our customers now have at least one other app integrated with HubSpot, and the average number of apps per customer jumped by more than 50% year-over-year. We’re talking hundreds of thousands of additional app installs. We’re energized by this number, which indicates that customers are seeing benefits from our platform. But it’s also exciting for our platform partners who are seeing greater adoption among our customer base. 4. We connected our platform partners, agencies, and startups. 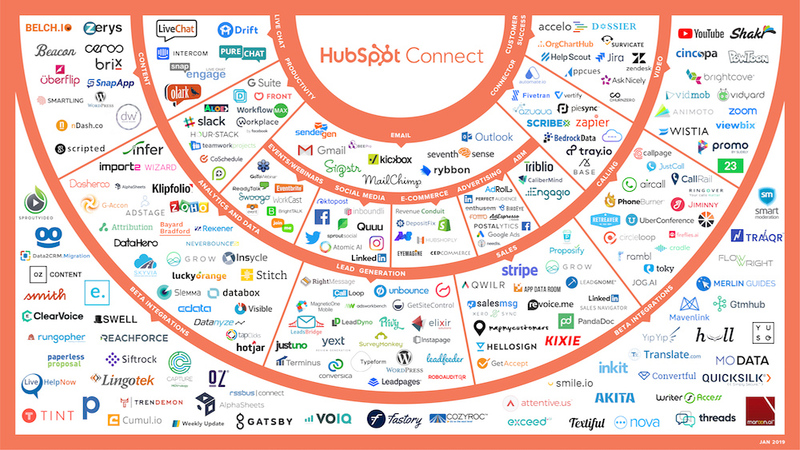 Some of the most valuable opportunities we can offer platform partners are connections with programs and communities across HubSpot. For instance, our global network of thousands of agencies and consultants helps businesses leverage our software to grow better. Increasingly, these providers are adding our platform partners’ products to the solutions they’re delivering to clients. This gives their clients more capabilities, expands their own service offerings, and lays the foundation for a powerful go-to-market channel. We’re seeing our agency partners leverage our platform in powerful and innovative ways. For example, Nextiny, a Platinum agency partner has curated a “tech stack” of apps from HubSpot’s platform ecosystem that they regularly deploy together for clients. Nextiny used this stack to overachieve on key business goals for their client, Jeeves Florida Rentals, and their success landed them a 2018 Impact Award for Integrations Innovation. To facilitate these types of relationships, we launched the Apps for Agency Services program last spring. It provides a structured way for platform partners who qualify to help agencies sell and service their software, including sales enablement tools and a free subscription for their own internal use. 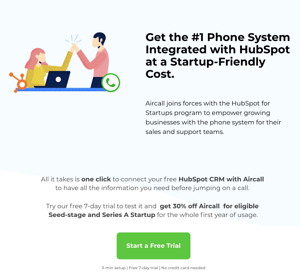 HubSpot for Startups is another thriving program partners with over 1,500 accelerators, incubators, and VC firms (like Y Combinator and Sequoia Capital) to provide startups with educational resources, event programs, and startup-friendly discounts on our software. Last year, we enabled platform partners to provide special discounts to qualified startups to help them build relationships with new ventures. To further build momentum between our platform partners and startup community, our platform marketing team researched the most commonly used apps for startups in our ecosystem and curated collections of apps for startups and free apps (including those with a freemium offering) in our directory. We were inspired by all the successful connections between platform partners, agencies, and startups that happened last year. We’re committed to facilitating even more of them in the year ahead. 5. We launched HubSpot Ventures and announced co-investment from Amazon Web Services (AWS) in programs to grow our ecosystem. In addition to expanding our platform’s APIs and extensibility and creating new app distribution opportunities for partners, we also made a couple of big announcements about growing the ecosystem itself. In December, we launched HubSpot Ventures, a new $30 million fund to invest in startups that align with our mission to help millions of organizations grow better. Some of the previous investments that we have made include Blissfully, Grow, Lorem, Privy and Terminus. At the same time, we announced a three-year commitment with Amazon Web Services (AWS) to help startups grow better. All AWS Activate members have access to HubSpot for Startups and AWS now offers Activate memberships and credits to participants in HubSpot for Startups too. AWS will also support HubSpot’s platform partner program by co-investing to build an ecosystem for HubSpot partners, including content tailored to developers. And, in the spirit of investing in our platform partners, we also extended HubSpot for Startups discounts to all certified platform partners who aren’t yet HubSpot customers but want to make the switch. We’ve got big plans for our platform ecosystem in the year ahead. For customers, we’re eager to bring you more apps and integrations that will expand your business’s digital superpowers. To see the latest ones, check out the new and noteworthy category in our directory. For partners, we’re dedicated to creating more opportunities for you to build your business on our platform. Last year, our entire executive team went on a field trip to learn from some of the best platform companies in the Bay Area. Our overarching takeaway was this credo: A platform should be measured by the success of its ecosystem. In 2018, we added three key hires to our team who are specifically tasked with helping our ecosystem succeed. Samantha Ceppos, our director of global partner and platform marketing, scales our ecosystem and ensures our partners are always looped in to changes and updates. Elizabeth Ruscitto, our director of developer relations, is leading the charge in improving our developer documentation, tools, and support. You can access our latest resources and sign up for a developer portal for free here. Hugh Durkin, our director of platform partner success, is focused on shaping our platform partner program to help partners grow their businesses within our ecosystem. Are you interested in joining us as an app platform partner? Learn more about the program here. We’re eager to grow better together.